Earth's magnetic field acts as a shield against dangerous cosmic rays and powerful solar winds. Some of the particles hitting the magnetic field become trapped and form large swarms of charged particles, mostly electrons and protons, arranged in radiation belts, known as the Van Allen belts. To protect satellites and space missions, it is important to understand exactly how the belts are shaped and how particles in them move. NASA has two probes studying the belts, and the latest results have been published in the Journal of Geophysical Research. 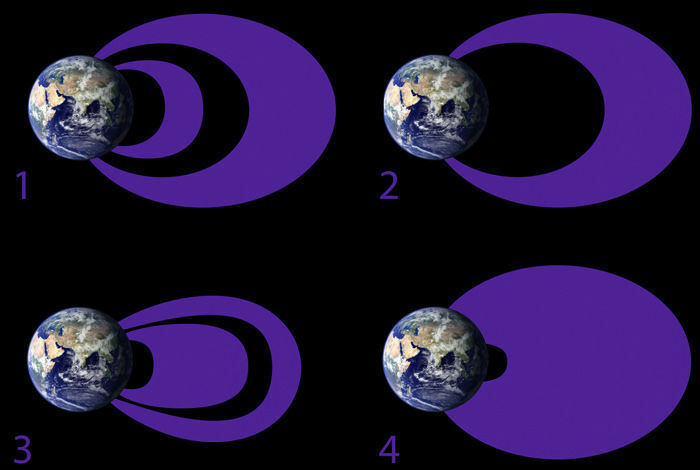 The belts were discovered in the 1950s and they were pictured as two concentric donuts, a small stable one between 1,000 and 6,000 kilometers (600 and 3,700 miles) and a large varying one between 13,000 and 60,000 kilometers (8,100 and 37,300 miles). But that no longer seems to be the case. The new analysis focuses on electron distribution through the belts. NASA's Van Allen Probes were able to measure electrons at hundreds of different energies and map how the belts change. According to the study, low-energy electrons form a thicker inner belt while the outer belt remains very thin. On the other hand, the highest energy electrons are only found on the outer belt and they cannot penetrate the magnetic field to populate an inner belt. But something peculiar can happen during geomagnetic storms. The belts are expanded and compressed, and when considering only lower energy electrons, the slot between the two belts disappears completely. The changes in the belts due to space weather are unpredictable so far, but the Van Allen Probes are the right tools to finally see the detailed effect of solar storms on the magnetic field. By modeling the evolution of the belts during calm and active periods, scientists will be able to protect both satellites and future astronauts during high-altitude missions.